In John 14:27 Jesus said to his disciples, ‘Peace I leave with you; my peace I give to you. Not as the world gives do I give to you. Let not your hearts be troubled, neither let them be afraid.’ They had not experienced the horror of planes crashing into skyscrapers, but their world was no less upside down and their future unknown. And they would all be giving up their lives in the years to come as the Church was established. Still, Jesus says not to be afraid. Through the work of the Holy Spirit they were going to be given an unworldy peace that they could rest in even as the world around them crumbled. Christians around the world are given this peace. Regardless of the trials and troubles we encounter, we can be like they who are planted by streams of water yielding fruit in its season, with leafs that do not wither. In all they do, they prosper. 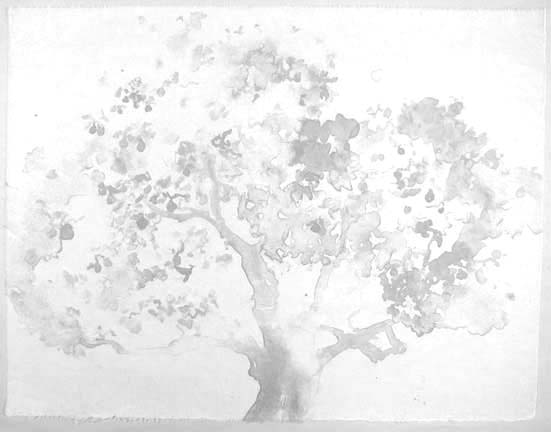 Makoto Fujimura: Shalom, 2001, 47,5 x 62,5 cm, hand printed lithograph on paper. Makoto Fujimura is an artist, writer, and speaker who is recognized worldwide as a cultural influencer by both faith-based and secular media. A presidential appointee to the National Council on the Arts (2003–2009), Fujimura has contributed internationally as an advocate for the arts, speaking with decision-makers and advising governmental policies on the arts. Fujimura’s work is exhibited at galleries around the world, including Dillon Gallery (New York City), Sato Museum (Tokyo), The Contemporary Museum of Tokyo, Tokyo National University of Fine Arts Museum, and Oxford House, Taiku Place (Hong Kong). Fujimura’s book Refractions: A Journey of Faith, Art, and Culture (NavPress, 2009) is a collection of essays bringing people of all backgrounds together in conversation and meditation on culture, art, and humanity. In addition to Square Halo Books’ Objects of Grace and It Was Good: Making Art to the Glory of God, Mako is featured in Rouault-Fujimura: Soliloquies alongside Georges Rouault. Fujimura founded the International Arts Movement in 1992. For more information go to www.MakotoFujimura.com.